A good quality food slicer brought to you by a brand you can trust. 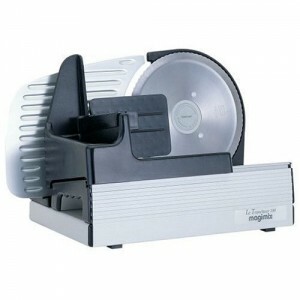 Magimix is a brand known for its build quality and good service, this black and silver stainless steel food slicer will deliver on both these counts and more. Included in the box are the food slicer, a food pusher to allow you to slice with ease, a safety guard to keep those fingers safe and an instruction book. 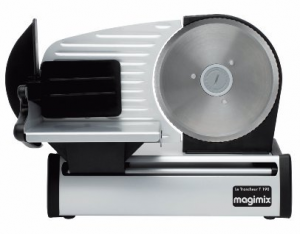 This food slicer has an all metal body and a 19cm steel metal blade that can be adjusted to allow you to choose how thick or thin you would like your chosen food to be sliced, this food slicer has an easy glide carriage to allow you to slice your meats, breads, cheese and so much more with ease and precision. This food slicer doesn’t just look good it performs well too and as soon as you get it out of the box and start using it you’ll wonder how you ever did without it.